How much does it cost to travel to Montenegro? How much money will you need in Montenegro? €59 ($67) is the average daily price for traveling in Montenegro. The average price of food for one day is €21 ($23). The average price of a hotel for a couple is €49 ($55). Additional pricing is in the table below. These average travel prices have been collected from other travelers to help you plan your own travel budget. How much money do I need for Montenegro? Located in the Balkans region on the Adriatic Sea, Montenegro is a nation best characterized by its rugged mountains, medieval villages, and a narrow strip of beaches along its Adriatic coastline. The nation also hosts a number of National Parks and historic towns. Bay of Kotor: Considered one of the most beautiful bays of Europe, the Bay of Kotor features a typical Mediterranean vibe with scenic towns and UNESCO World Heritage Sites, like Perast and Kotor. It encompasses Montenegro's northernmost coastal area. Budva Riviera: This region makes up the nation's central coast and features the main tourist drag with pleasant beaches, historic villages and a thriving nightlife. 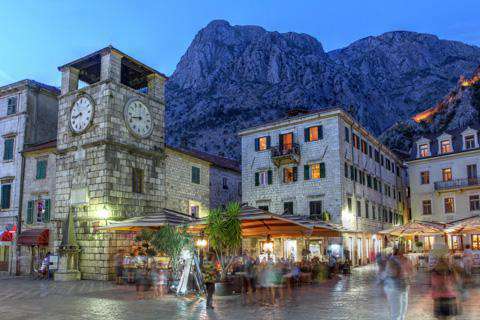 Central Montenegro: Just inland from the coast, Central Montenegro makes up the heart of the nation. It is home to the state capital Podgorica, the historical capital Cetinje, and the industrial center NikSic. Skadar Lake National Park and Lovcen National Park showcase the region's natural beauty as well. Montenegrin South Coast: This is Montenegro's southernmost coast on the Adriatic Sea. Its main hubs are the towns of Bar and Ulcinj. North Montenegrin Mountains: Furthest inland, this region is a place dominated by natural scenery. It is situated within the Dinaric Alps and features some of the wildest beauty in the nation, like Durmitor National Park's Tara River Canyon. Zabljak is the center of Montenegrin mountain tourism and a popular spot for skiers. Kotor: The Bay of Kotor, which resembles a fjord, is dotted with coastal churches and fortified towns such as Kotor and Herceg Novi. Kotor itself is a beautifully preserved fortified, medieval town, featuring a labyrinth of cobbled streets, lively piazzas, historic churches, and an entire spread of bars and restaurants. Some of the most impressive churches include the 12th century St. Tryphon Cathedral, the Church of St. Luke, and the Orthodox St. Nicholas Church. Budva: A coastal resort in Montenegro, Budva is probably the country's most popular tourist destination. Not only does it host a number of great beaches, but it is also home to a picturesque old town center located on a small peninsula. Some of its best features include narrow winding lanes, historic buildings, churches, and small squares. The walled town center also has a medieval town fortress referred to as Citadela. National Parks: Boasting a plethora of beautiful natural scenery from its glimmering coastline to its mountainous inland, Montenegro also hosts a number of national parks. Biogradska Gora National Park is one of furthest inland, standing as one of the last remaining untouched forests in Europe. Durmitor National Park is Montenegro's other inland treasure. This park's most sought-out attraction is the Tara River Canyon, the deepest canyon in Europe and a hub for rafting excursions. Closer to the coast is Lovcen National Park where many visitors climb to the top of the mountain for stunning views. And finally, there is Skadar Lake National Park, the largest lake on the Balkans with a very diverse ecosystem of flora and fauna. By plane, Podgorica Airport is Montenegro's main international airport, located about 12 kilometers south of the capital city Podgorica. It serves as a hub for Montenegro Airlines. Tivat Airport is situated near the city of Tivat, on the Montenegrin coast. It has regular flights to Belgrade and Moscow throughout the year, and has charter flights to major European destinations during the summer. Another possible flight option is Dubrovnik airport in Croatia, a half-hour drive from the Montenegro border. It is served by many major airlines, making it a good option for tourists coming by plane. Montenegro is also well-connected to neighboring countries by bus; there are trains from Belgrade, and ferry lines from Italy. Because of its proximity to the sea, Montenegro has plenty of fresh fish and seafood dishes. These dishes are typically garnished with polenta, blitva (a kind of spinach), or broiled potatoes. Drying fish is also traditionally practiced along the coast. Further inland, meat is more popular with selections of mutton, pork, beef, and poultry used in a variety of dishes. Meats are often served with vegetables and Kajmak (a kind of clotted cream made with sheep's milk). Montenegrin cuisine also distinguishes its soups: 'supa' for clear soup, 'corba' for a thick soup or stew, 'kasa' for a porridge-style dish. For dessert, there is an assortment of local sweets, including palacinke (a large pancake filled with jam, chocolate or cream), baklava with raisins and walnuts, krofne (doughnut filled with jam or chocolate), and a cream layered cake called krempita. Most sweets are served with coffee.